Application: Series 1 from 1955, Series 2 suffix A & B gearboxes only. Description: Reproduction primary pinion and constant gear. Pinion has 20 teeth and constant 31. 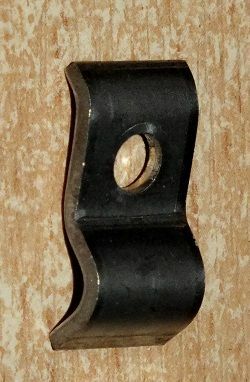 Shown wired together in photo as there are a matched pair. 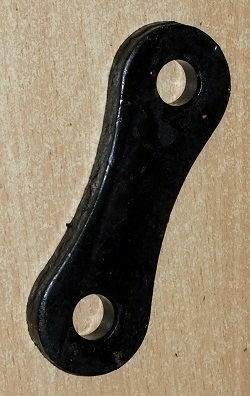 Approximate dimensions: Pinion overall lrngth 28.3cm (11.1"). Application: Series 1 and Series 2 except all syncro boxes. 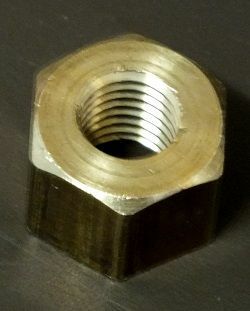 Description: Reproduction castellated nut with left hand thread for retaining bearing to input shaft. 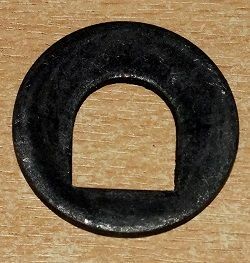 Approximate dimensions: Overall diameter 57.15mm(2.25"), depth 11mm(0.43"). Application: Series 1 and Series 2 up to suffix 'C' inclusive gearboxes. 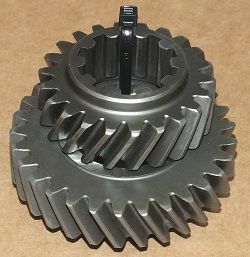 Description: Replacement matched pair of gears for second speed in part - syncromesh gearboxes. 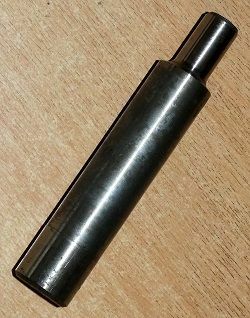 Approximater dimensions: Mainshaft gear: outside diameter 92mm(3.62"), inside diameter 39.8mm(1.57"), length 32mm(1.26"), 29 teeth. 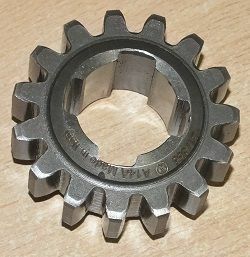 Layshaft gear: outside diameter 70.6mm(2.78"), inside diameter 33.5mm(1.32"), length 27mm(1.06"), 22 teeth, 10 internal splines. Application: Series 1 and Series 2 with part syncromesh gearbox. 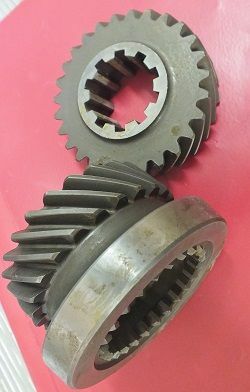 Description: Matched pair of gears for third speed. 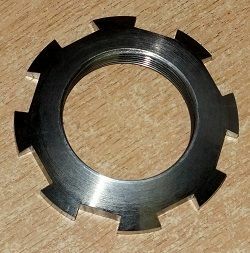 Approximate dimensions: Mainshaft gearf - 24 teeth, outside diameter of gear 76mm(3.0"), inside diameter 39.6mm(1.56"), lrngth 47.5mm(1.87"). 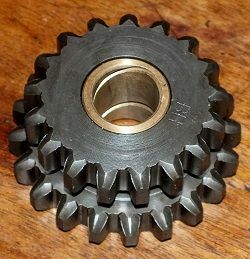 Layshaft gear - 27 teeth, outside diameter 85mm(3.35"), inside diameter 33.4mm(1.32"), length 25.4mm(1"), 10 internal splines. Application: Series 1, 2 & 3 four and six cylinder models. Description: Syncro hub assembly on mainshaft for selecting 3rd and 4th gears. 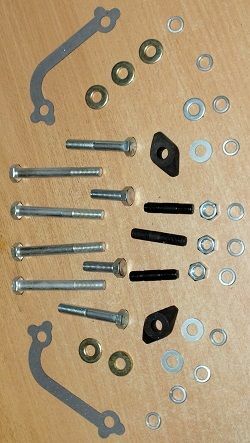 Now only available as a replacement part. Application: Series 1, Series 2 and Series 3 4 and 6 cylinder models. 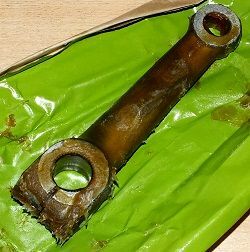 Description: Replacement sleeve to support third and second gears on the mainshaft. Approximate dimensions: Overall length 69.6mm(2.74"), inside diameter 34.2mm(1.35"), body diameter 39.6mm(1.56"), shoulder diameter 54mm(2.16"), shoulder thickness 11.4mm(0.45"). Application: Series1 and Series2 to suffix 'B' gearbox. 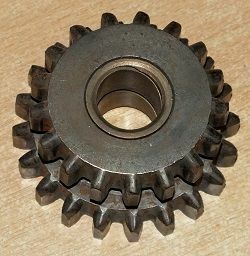 Description: Reproduction first speed gear on layshaft - 15 teeth. 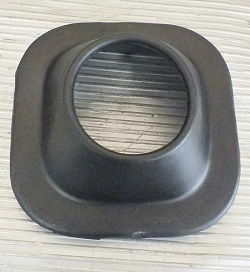 Approximate dimensions: Overall diameter 58mm(2.3"), internal diameter 25.4mm(1"), length 25.4mm(1"). Application: Series 1, Series 2 and Series 2A with part syncromesh gearbox. 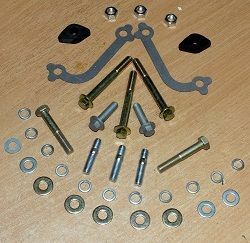 Description: OE spec reverse gear assembly with bronze bush. Larger wheel has 20 teeth, smaller 17 teeth. 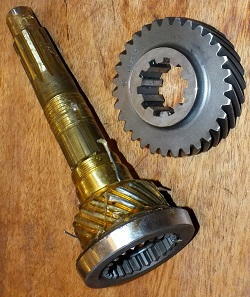 Description: Refurbished used reverse gear assembly with bronze bush. Larger wheel has 20 teeth, smaller 17 teeth. 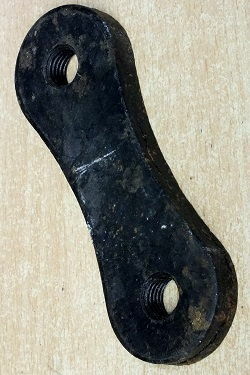 Description: Reproduction shaft for reverse gear. 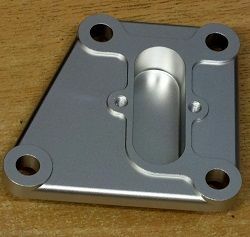 Approximate dimensions: Overall length 10.8cm(4.25"), diameters 20.6mm(0.81"), 20.3mm(0.80") and 12.8mm(0.5").